ONE OF THE MOST SAFE AND POPULAR EAs !! * Low Risk / Consistent Profit EA. * Works on EURUSD on M15 Timeframe only. ATTENTTION TRADERS : Basket Lock check will work as FUSE to ensure that the account is not blown down. After a basket is locked, trader gets proper time to manually study the orders and close them as per his knowledge. After a basket is locked, Asmani will continue trading with fresh basket. 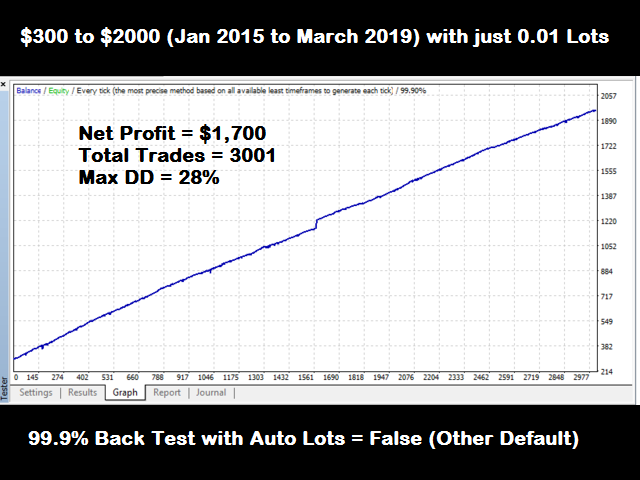 Hence BaseketLockCheck = true will not work in Backtesting !! If you are using data with lower precision than 99.9%, then the results may vary !! Great EA, I have it running on a live account with steady results so far. Backtesting is also solid. Excellent support from the developer. 5 stars. Excellent EA. Believe me when I say that I have used many EA. Almost all of them have been disastrous. Asmani is one of the few reliable ones. It works on a simple logic and has an excellent P/L ratio. My equity has been growing steadily. The author is proactively updating the EA. Has a good blog and is open to suggestions. Thanks Mangesh. Best EA I have used ever , Author is helpful and supportive. also he listen to customers. Amazing EA. I have been using this EA for one week now. It looks very impressive. My hearty congrats and thanks to the author for coming up with such an EA. I have two MT4 accounts on two separate instances on aws (amazon) VPS server. How do I apply the EA to both accounts? Currently I am using the EA on one account successfully without any issue. When I tried to apply the EA on the second account, it appears that the EA is running but it is not taking any trades. Do I have to buy another license (which I am willing to do) and if yes, how do I go about implementing it? Please let me know. Thanks. EA works very well, low DD, Daily good Profit. Mr. Mangesh Is a very kind person and answer every email. It opens every day two three times baskets. You can go to sleep an live your computer to mister Mangesh. Best EA in the market so far.. Opens limited trades in a day and closes them down on a decent profit.. No lagging trades...One of the best EA's i can trust on.. Nd yes, To be very frank and honest - The author is super supportive as well. Thanks for the super development. Excellent EA as well as friendly and helpful support from the author, Mangesh. Like the approach and logic for the EA that allows for a conservative yet consistent profitable outcome. Just move from test to live and so far working as expected. Also, appreciate the attention to both updates and improvements. Deserve maximum stars. Thank you very much!! Very reliable expert, the best I have tried so far. And the support of the creator....absolute top notch, he answers your question almost "on line". Thanks, Mangesh: sure you will get a superb EA, and we will benefit from it. The EA got better now, the developer is really a nice guy. The default settings of V18.1 are working well. The only problem is the year 2014 where it could crash the account. Great EA and developer. Constant updates and optimization. Had the free version and bought the paid one because the author Mangesh and the EA are that good. So far this is totally recommended. This EA is awesome, and best of the best is author's support. This deserves ten stars ! This is the "Real thing" in mql5 market with very good support from the author. You should buy it. From my interactions with Mangesh, I can certainly say that a lot of effort has gone into developing this EA and most importantly the risk has been minimized almost to nill. He is an experienced developer with almost three decades of programming experience. It was a pleasant experience interacting with Mangesh! I have thoroughly backtested Asmani EA with below changes as recommended by the author Mangesh. Reat all settings are default. I could not find a case where the EA was failing. The final drop if you see, thats because the data is over and all the open orders are closed with their standing positions. I will tell all how I actually moved it. Stars were increased from 3 to 4! I purchased EA a week ago. I faced some minor issues running the EA but quickly resolved by the author Mangesh. He is contantly upating and improving EA. The EA is on fire with profitable orders. I am sure this EA will go very long way and can be used for profitable trading and gradual increase in equity growth. No dangerous trading method and opening orders in the direction of movement gives peace of mind. And I am a happy customer. Excellent support, EA seems conservative yet consistently profitable. I have had four trade baskets, all four have closed profitably. I will keep posting weekly performance in the comments section. 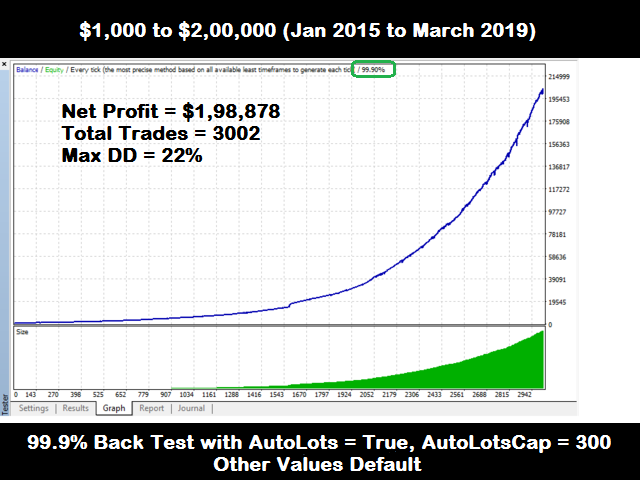 Lot multiplier should be 1 for every $100 (average or medium risk). Expect on an average 1-2 trade baskets daily. Excellent product with an outstanding customer service. A must have aid to support Forex profitability. Использую уже 3 недели, удивительно, но все сделки пока идут в плюс. Продуманная стратегия входа и нормальный профит. Хорошая техподдержка, автор постоянно на связи. Exactly Same as 20.0... Just improved status box by adding few more informative inputs.. and modified internal variables for indicators. 1) Safety Lock added by locking the Basket with equal no. of buy orders and sell orders in case of Market goes in wrong direction even 7th trade. 2) AutoLotsCap increased to 1000 for more safety. 1) Default values changed as per new back tests. Max DD per Basket is changed to % of equity..